This photo of Lauren’s home office caught my eye ~ the bright orange sofa, vintage typewriter and phone, and French chair. Stunning! I was intrigued to see more and was not disappointed, the girl has style and a wonderful interior designer! 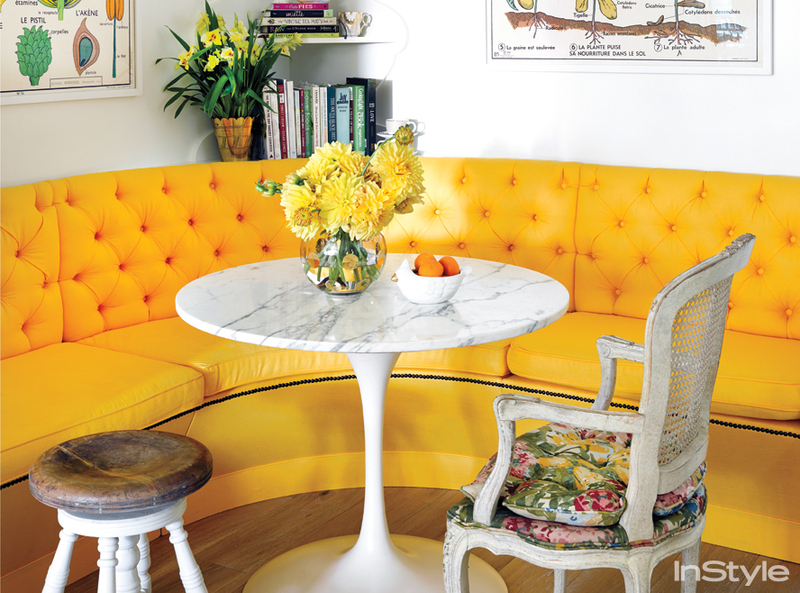 I love Lauren’s use of bright colours in her home. Many people are afraid of bright colours, however, a few pops done right like this custom tufted banguqet and orange sofa make a home feel bright and cheery. I plan to incorporate this Eero Saarinen table in my kitchen also. To be honest, I’m not fond of anything in this bath other than the bathtub and paneling. It’s a nice room but the chair looks uncomfortable and the lights along the mirror make it look too “Hollywood” rather than a home. The living room is designed in neutral shades with complements of black and gold. 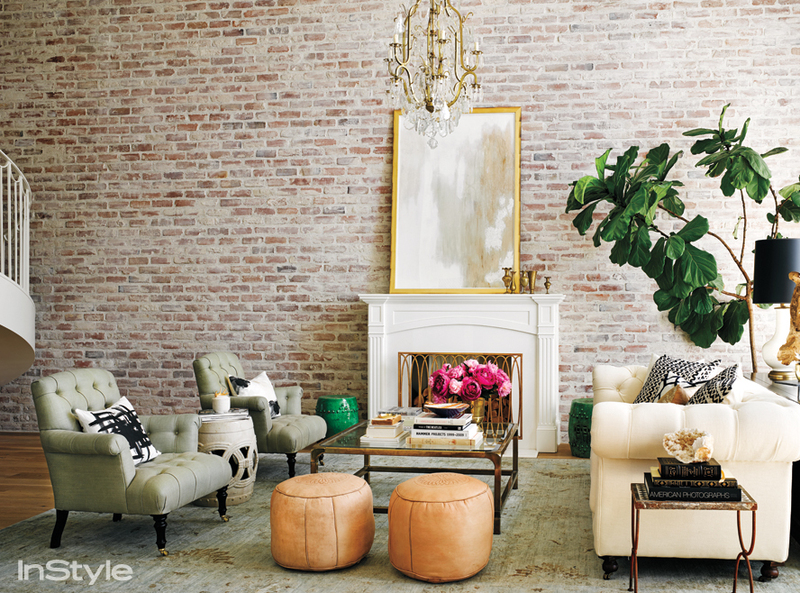 I love the tufted sofa. Lauren added a brick veneer that was whitewashed to look more aged. The chimney-less fireplace is decorative and burns alcohol. The vintage dining table and chairs pair well with the contemporary lighting. 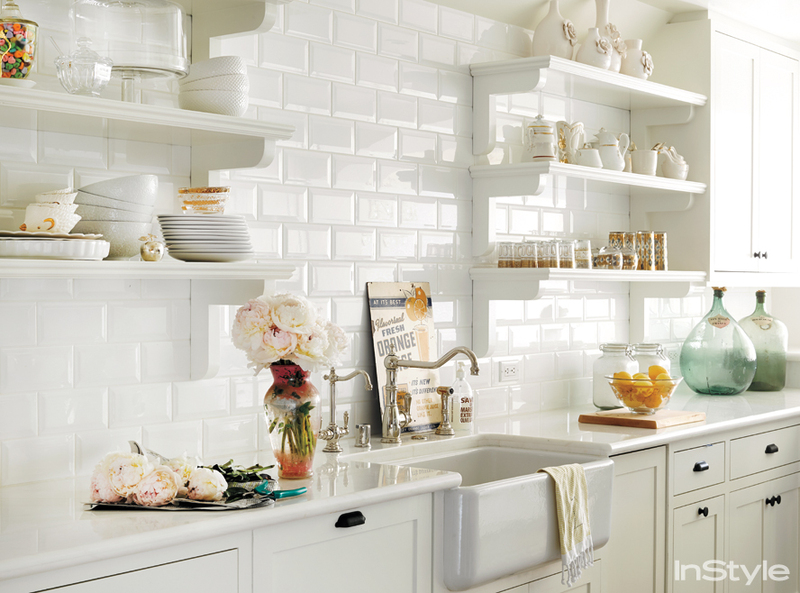 I really love her kitchen ~ casual and airy. I have the same hedgehog measuring cups displayed on her bottom left shelf. I love them and they make cooking more fun. Her dressing room features mirrored and glass sliding doors, stacked vintage luggage, and small chandelier. As always, I love the French chair. What do you love about Lauren’s Beverly Hills penthouse? 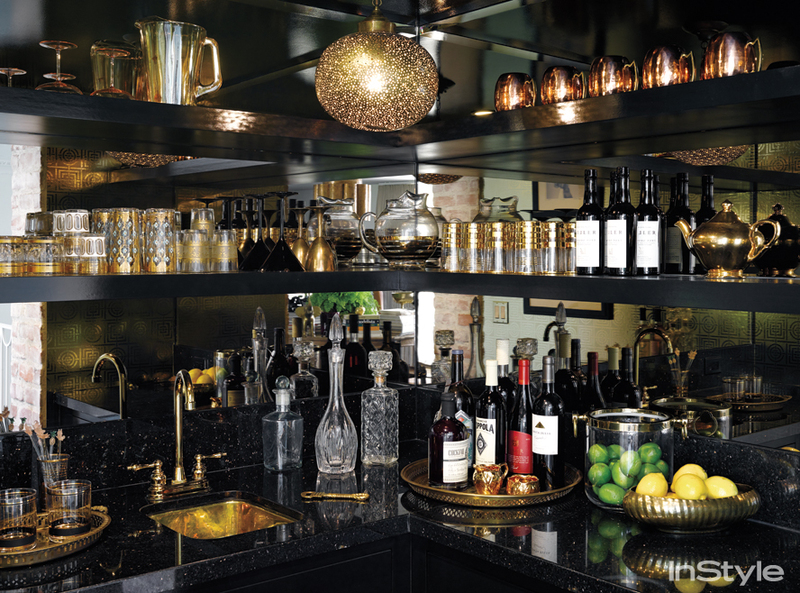 LOVE kitchen too so very much and her dressing room…. By the way…Many stunning design details in whole home! This is such an interesting home with so many design details. I'm a fan of French chairs and tulip tables too. I especially like the kitchen as it's so light and airy, practical too with everything to hand..